In the first level of Reiki you learned to relax and let the energy do its work. In the second level your ability to relax will deepen, but now you will also learn to bring specific intention to the healing process. You will do this primarily through three symbols, which have been used by Reiki practitioners since Mikao Usui. The symbols were planted within you at level one; at level two you become consciously aware of their form and function. It will not take you long to memorise them: even the big one, HSZSN, will stick if you practice it often enough. Once memorised you have powerful tools that can be used at any time during a healing, or indeed at any time or place. As part of your level two training you will learn how and when to use them in your daily life. The second level also brings with it the recognition that you may want to practice Reiki professionally and make some or all of your living by offering Reiki treatments. It therefore offers you advice on how to set yourself-up as a Reiki professional, with practical tips such as whether to buy a massage table, and how to set the right price for your treatments. 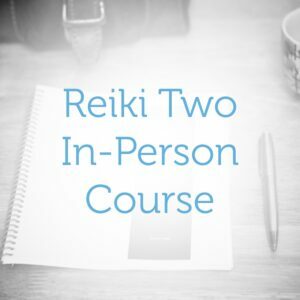 Are you ready for Reiki Two? Are you practising regular self-healings? If you are not, three months is not enough time. One of the most fundamental lessons to learn at the first level is to get out of the way of the healing: to put your own desires to one side, and to allow whatever happens to happen. This is an ongoing journey, but if you are looking to get more power or control over the healing process, you have not finished learning what you need to learn. Do you have a heart-felt desire to deepen your connection to reiki? In all such matters, trust your heart above all. We start the course with a cup of tea and a some warm-up activities. It’s an opportunity for us to get to know each other better. We also look at some wisdom cards before moving on to the course content. Break for lunch. Lunch is provided. Level two of Usui Shiki Ryōhō, taught by Kit Johnson. This is a two-day course, with a maximum of six students. Lunch and transportation from the center of Bangkok is included in the course fee. If you are desperate to study but cannot afford the fee, please apply, and tell me a bit about your situation on the 'extra details' question. For more details about this course, see the level two course page. You can start studying module one right now, for free. Get started now. Your teaching is easy to understand and fun.